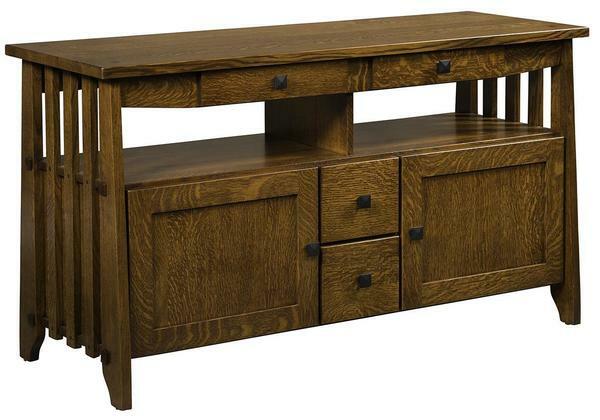 Our Amish Heritage Stick Mission TV Cabinet will support your television and related media equipment with a unique mission-style design that will enhance any space while providing options for storage and organization. Along with a solid rectangular top for your plasma or flat-screen TV, this stand includes four dovetailed drawers on full extension glides, and two Shaker panel doors. Tapered aprons mimic the tapering design on the legs. Mission-style slats on the sides and open shelves under the top complete the design. The 1-inch thick top also includes square inlays. Customizable in your choice of wood type, finish, and hardware from a variety of options, this stand in shown in quarter sawn white oak with walnut inlays and FC-113 Michael's.